In the third installment of our video tutorial series highlighting the exciting updates to Native Instruments‘ comprehensive producer bundles, Komplete 8 and Komplete 8 Ultimate; Dubspot instructor and NI’s product specialist Matt Cellitti explains and demonstrates why Studio Drummer from Native Instruments truly makes Komplete more “kompleterer”. 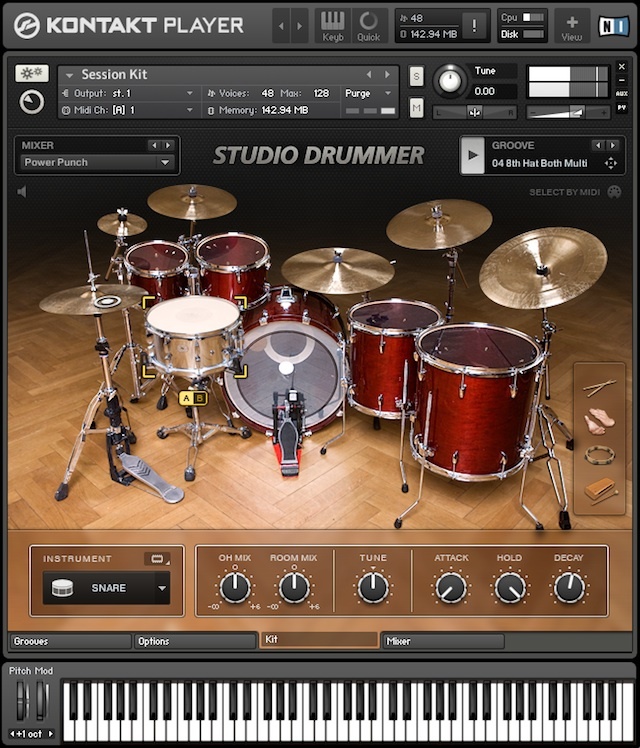 Komplete has always had good options for sequencing acoustic drum parts, but this is the first acoustic drum instrument from NI that allows the user total control over every necessary aspect that a musician will need when making realistic, acoustic drum tracks. You are able to pick from over 3,500 drum grooves, simply dragging and dropping these grooves into your DAW arrangement as needed! The real power of this instrument is the built-in mixer section, complete with EQs and Compressor modeled after one of the most famous mixing boards in the world. All of the drums are laid out on their own channels, each with an amazing signal chain just like you would have in a top notch recording studio. This program can either be incredibly easy for you to use, or you can go way in-depth, getting hands on with every channel, frequency, and dynamic possibility you could ever need. For most people, it could easily be the only drum instrument needed for all of their acoustic drum programming. The fact that you get it inside of Komplete 8 or Komplete 8 Ultimate is even more exciting. See dates and register for NYC and online classes! You will learn to create your own sounds through different techniques and then go beyond the presets, adding a sonic signature to your tracks. For composition with acoustic instruments, we introduce you to the latest sampling technology and give you access to the world’s largest and most diverse sound library. In the advanced levels, you will acquire total control over all aspects of the instruments presented in courses 1 through 3 while practicing genre-based sound design. And with Reaktor, you will get access to some of the more unusual tools of synthesis, step sequencing, beat making and effects: all elements used in today’s cutting edge electronic music.